. Published on July 4, 2014 . Dream Grid is a template for blogger which is highly responsive and has a grid type of design generally called as Masonry layout. Dream Grid is a multi purpose blog themes that cater to the needs of the bloggers nowadays. Dream Grid is fully responsive in itself, as the theme adapts its layout according to the screen sizes. Dream Grid is a blogspot themes that poses awesome smart looks and can also be considered as a multi purpose templates for blogger. Dream Grid blogger template download is also available above but there are some disadvantages given below for the free version. 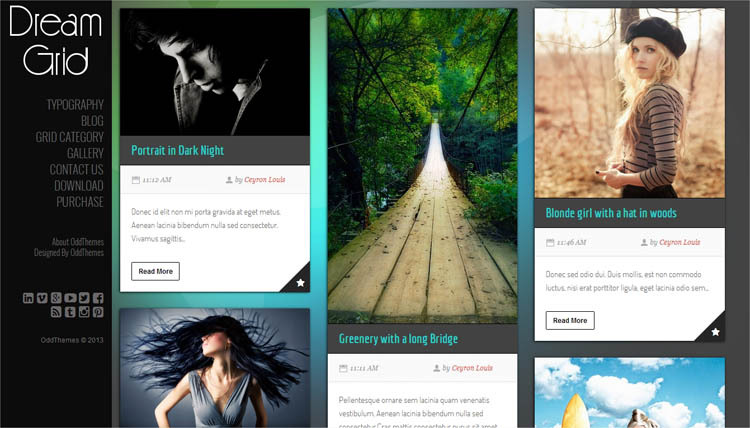 Dream Grid blogger template download is also available on the main website that is: OddThemes. Irremovable Footer Links, one can’t remove our footer links because removing footer links will redirect your website to www.oddthemes.com. This is the initial version of this template and it may come in many versions which will be available free for the users who purchases this theme. We are Web Designers and Web Developers who are capable of great zeal for work. Aspiring connoisseurs of Design.